Crown CopyrightAn aerial view of HMS Queen Elizabeth on December 7, 2017. 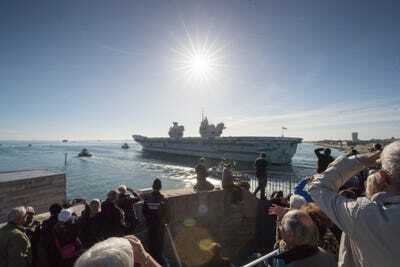 The arrival of HMS Queen Elizabeth has been the military story of the year in Britain – and this week was an important landmark, the moment it formally joined the Royal Navy. 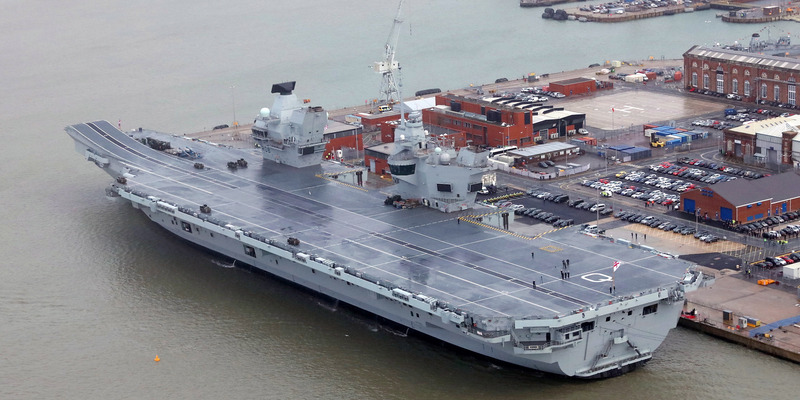 The new aircraft carrier, along with its sister vessel HMS Prince of Wales, is meant to spearhead a new generation of British hard power. Business Insider was invited on board to learn more about the event – read on to find out what we saw. December 2017 was one of the biggest months in years for the Royal Navy — its largest and most expensive ever ship formally joined the fleet. Getty ImagesHMS Queen Elizabeth on the morning it was formally commissioned into the Royal Navy. 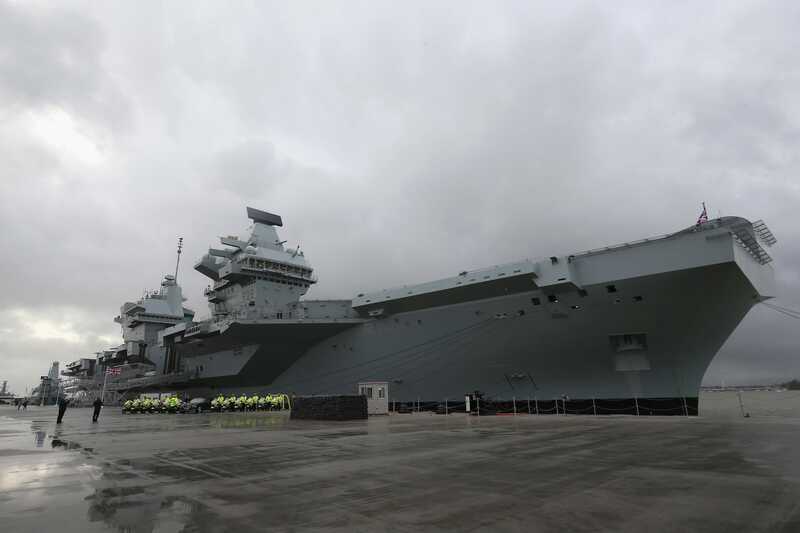 HMS Queen Elizabeth set sail for the first time in early 2017, but had to undergo tests at sea before becoming an official part of the navy. 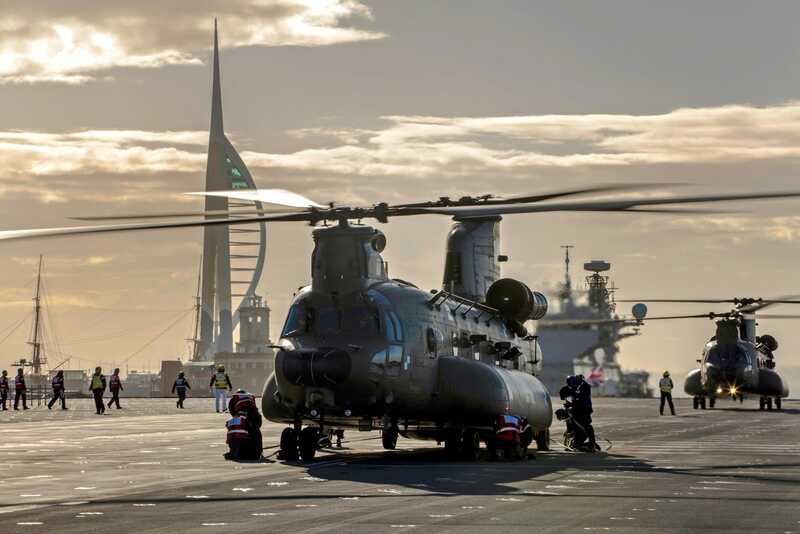 Getty ImagesHMS Queen Elizabeth sails out of Portsmouth for sea trials on October 30, 2017. 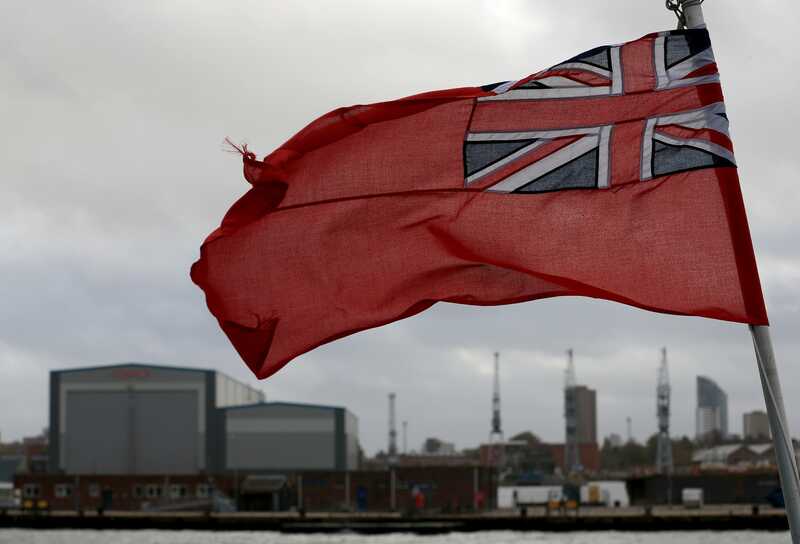 December 6 was the day when the ship was “commissioned” in a ceremony starring Queen Elizabeth II. 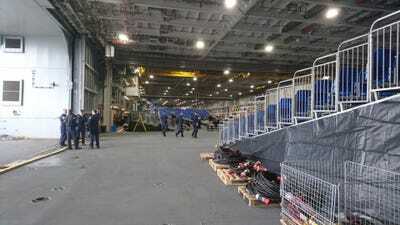 As part of the celebrations around the carrier, Business Insider was invited on board to see some of the preparation, and talk to a few crew members — here’s what happened. 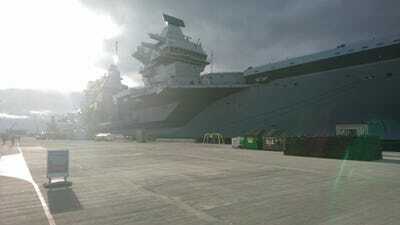 Business Insider/Kieran CorcoranMy 5/10 smartphone photo from the dockyard. 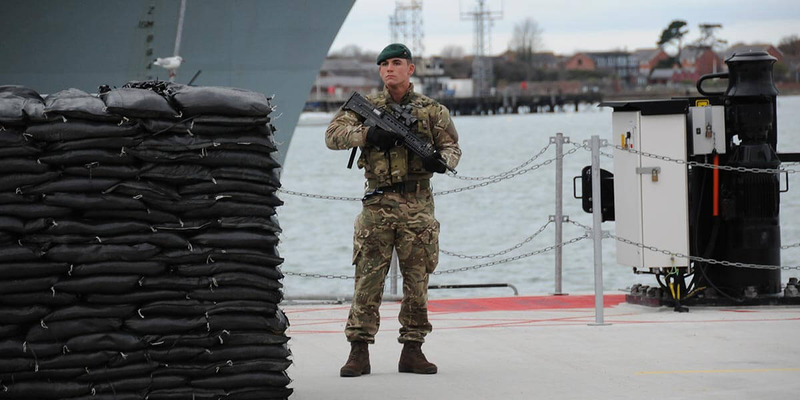 Nobody gets into the Queen Elizabeth’s new home, Her Majesty’s Naval Base, Portsmouth, without an invitation and security check. Getty ImagesThe Unicorn Gate entrance to HMNB Portsmouth, as seen in 2013. 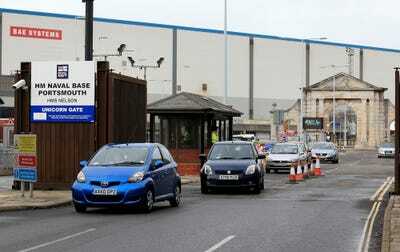 We were invited, so after hanging out with some other media at Unicorn Gate – one of a few tightly-controlled entrance points – we made our way in. HMNB Portsmouth is huge, and houses much more than the Queen Elizabeth, so we took a ride past some other naval hardware to get inside. 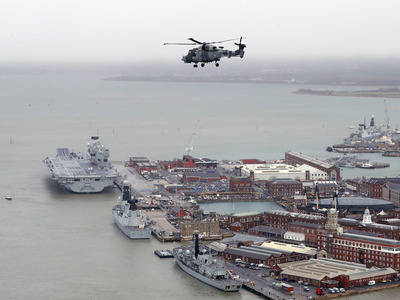 Getty ImagesA view of the naval dockyards from the sea. 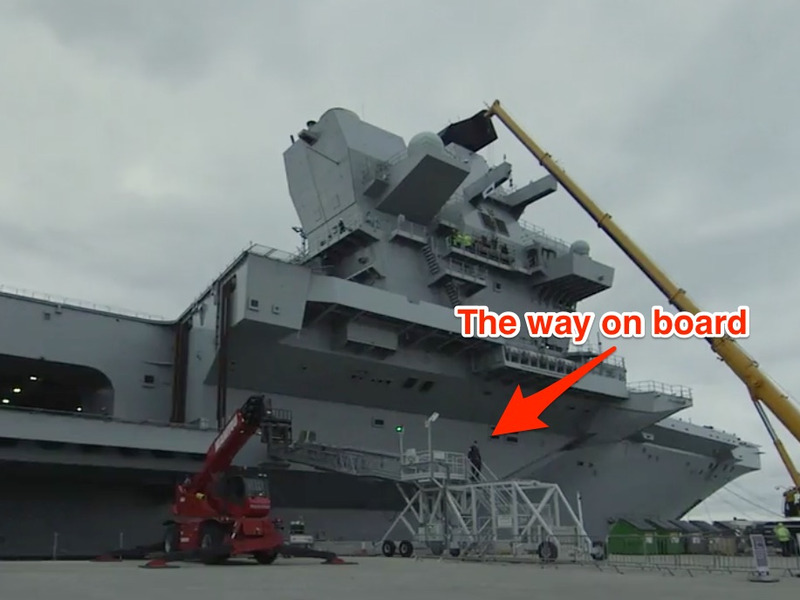 Then we had another layer of security — more checks and two locked doors — to get to the part of the dock housing the carrier itself. Crown CopyrightHMS Queen Elizabeth’s docking area seen from the air in Royal Navy footage. There were Royal Marines outside on patrol with automatic rifles and live ammunition. 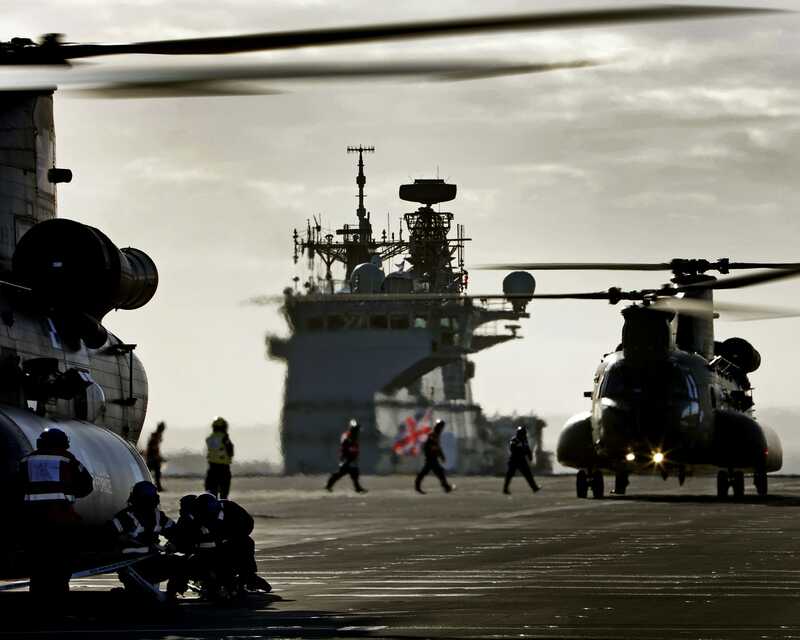 This photograph was taken by Pete Sandeman of the campaign group Save The Royal Navy, who was also on our visit to the Queen Elizabeth. We were led on board up a narrow metal gangway, while the naval officer leading us received salutes from the sailors she passed. Business Insider/Kieran CorcoranThe narrow entry-point to HMS Queen Elizabeth. We went down a floor from where we entered to the aircraft hangar — which in future will hold dozens of fighter jets and helicopters ready for operations. 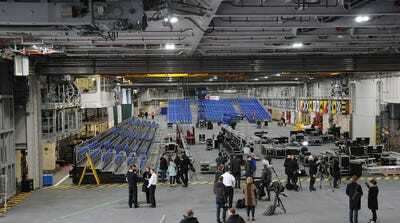 Business Insider/Kieran CorcoranThe interior of HMS Queen Elizabeth’s aircraft hangar, two days before the commissioning ceremony. 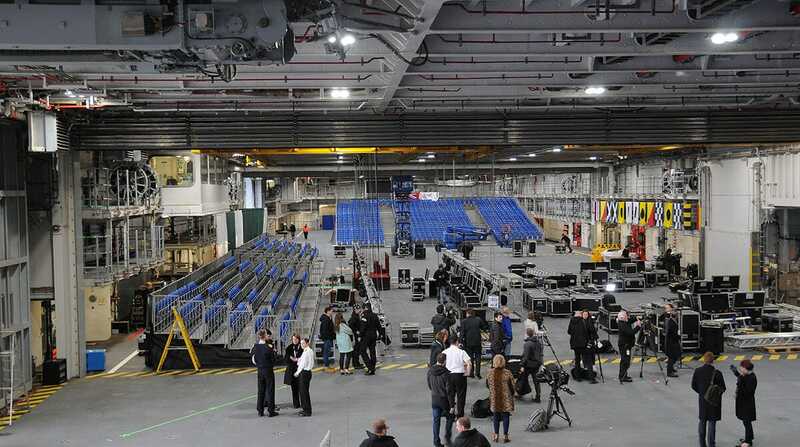 But when we visited the hangar was not yet full of F-35 stealth fighters (which are due to start arriving from the US soon), but was a temporary auditorium for the commissioning ceremony. The hangar is on top of the magazine, a huge compartment of the carrier full of bombs and other munitions which can be automatically brought into the hangar to “weaponise” (load up) the aircraft. Save The Royal NavyA broader view of the hangar (I’m in the bottom-right of the photo). 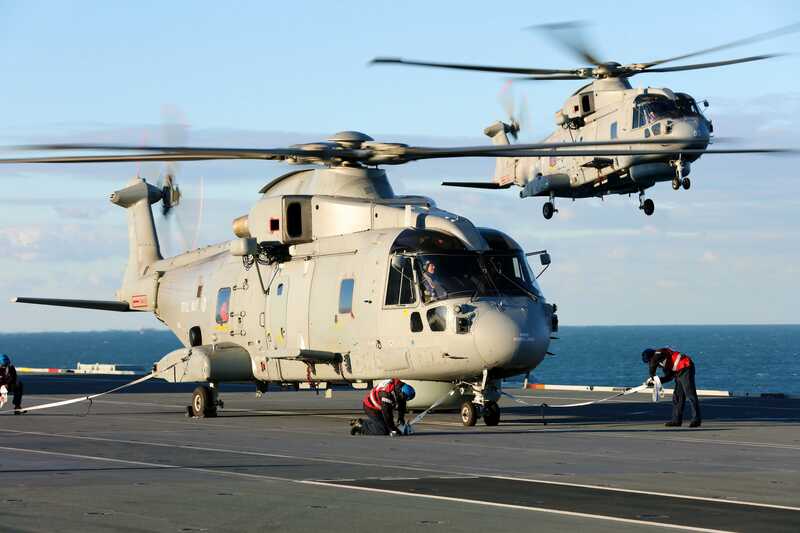 The Queen Elizabeth’s munitions loading systems are automated, which makes the process of equipping aircraft a lot faster than in previous carriers. While we were there the captain of the ship swung by to say hello. 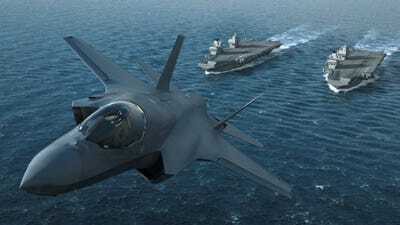 Business Insider/David IbekweCaptain Jerry Kyd, the commanding officer of HMS Queen Elizabeth. Jerry Kyd spoke to Business Insider about the ceremony ahead. But also about working with the US Navy, putting the ship through her paces, and a future for drone technology on board. 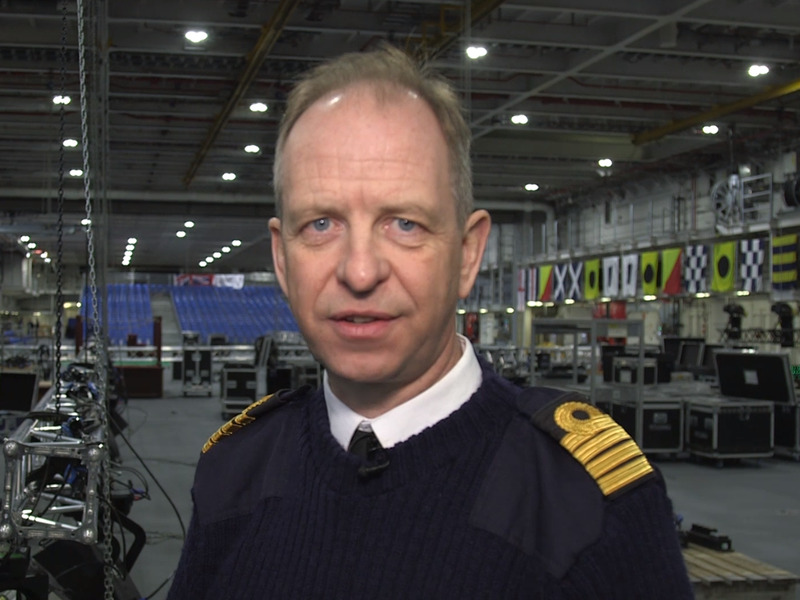 Watch some more of our interview to hear what he said. 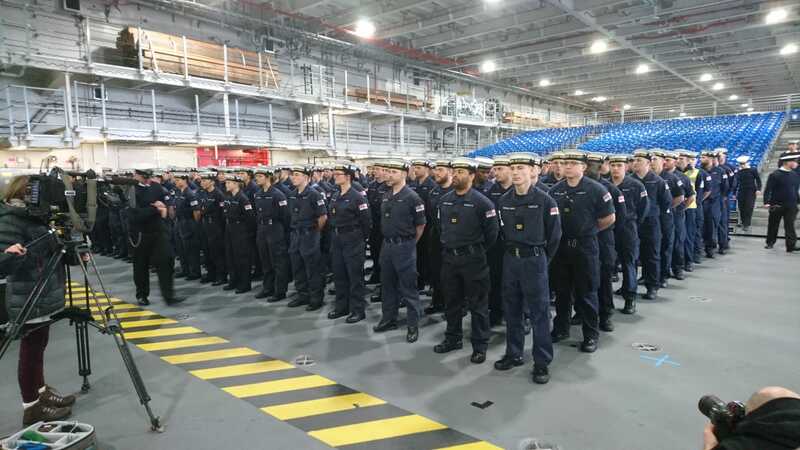 Then we saw sailors file in to practice drill ahead of the big commissioning ceremony. 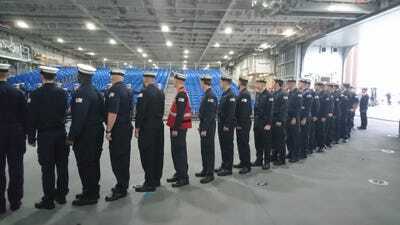 Business Insider/Kieran CorcoranSailors line up in single file ahead of a drill session on board HMS Queen Elizabeth. Here they are in formation. Senior non-commissioned officers yelled instructions while the junior sailors snapped to attention and practiced cheering for the Queen. Getty ImagesCrew from HMS Queen Elizabeth wave their hats and cheer ahead of the ship’s commissioning service. Then we went further into the ship, to the galley (kitchen), where chefs were getting ready to feed the Queen on her visit two days later. Business Insider/David IbekweChefs on board HMS Queen Elizabeth prepare pastry. HMS Queen Elizabeth has five galleys overall, and can comfortably provide 1,500 people with three meals a day. 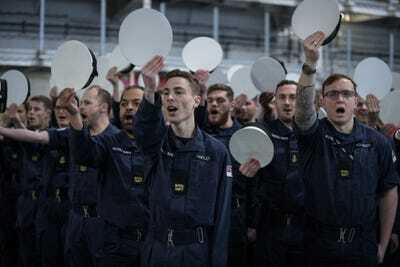 We spoke to their boss, Petty Officer Dean Allen, about what’s on the menu for Her Majesty — which he choose with a little help from Buckingham Palace. 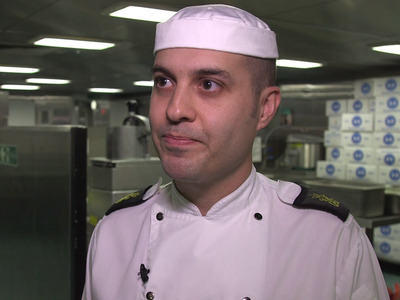 Business Insider.Petty Officer Dean Allen in the aft galley of HMS Queen Elizabeth. You can read the full details of the Queen’s menu here with more details from our conversation with PO Allen. 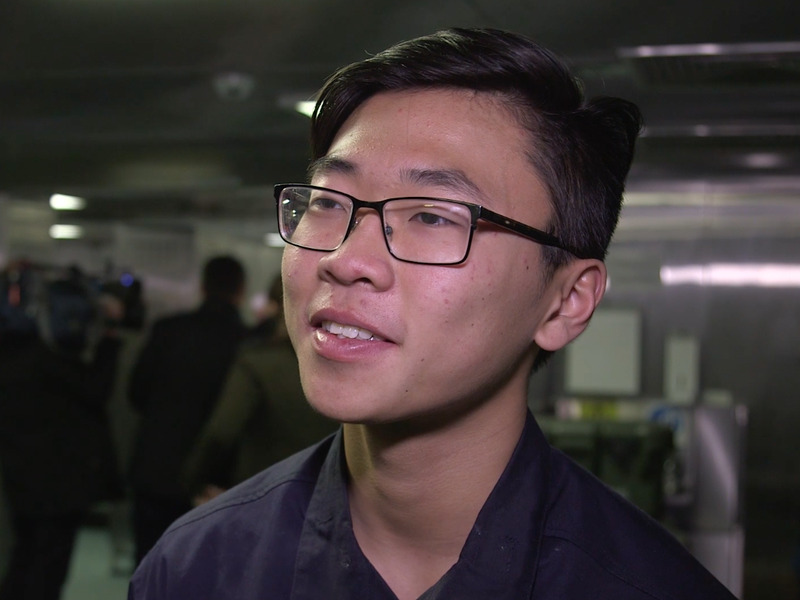 We also got to speak to the youngest crewman on board, Able Seaman Callum Hui, who told us about what it’s like to be 17 on board an aircraft carrier. Business Insider/David IbekweAB (Able Seaman) Callum Hui, the youngest crewman on HMS Queen Elizabeth. AB Hui told us there are lots of pluses. It’s an exciting job straight out of A Levels, there’s a lot of camaraderie, and, in Hui’s case, you get to meet the Queen. But he did say that when you’re at sea for weeks on end, it can be tough getting by with no internet connection – and no social media. Here’s AB Hui cutting the ceremonial cake during the commissioning ceremony — a job traditionally given to the youngest crewman on board. 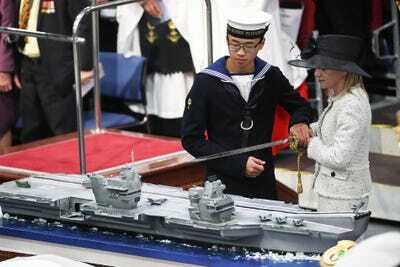 Crown CopyrightHui and Dr Karen Kyd, Captain Kyd’s wife, cut the ceremonial commissioning cake with the captain’s sword. We’d already overrun by that time, so it was time to head back up into the hangar and be on our way out — guttingly without the chance to see the flight deck. 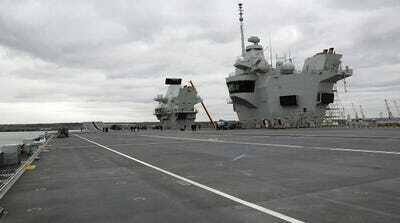 Save The Royal NavyThe flight deck of HMS Queen Elizabeth, looking towards the ‘ski jump’ take-off ramp. But Pete Sandeman from Save The Royal Navy did get that part of the tour, and shared some photos with us. 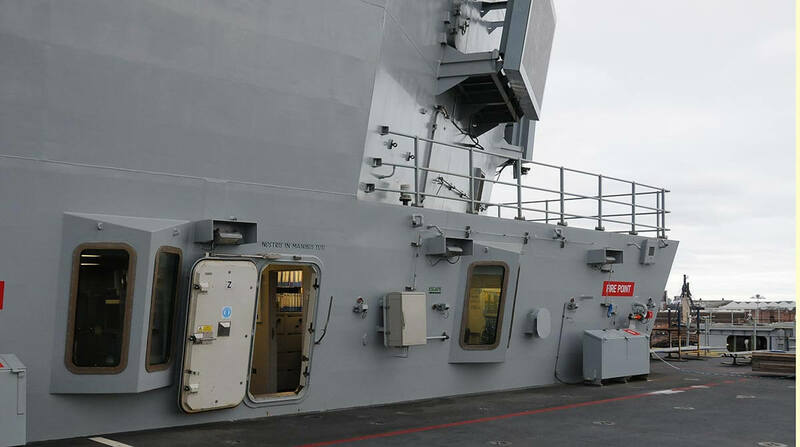 Here’s the rear of the two “islands,” which will be used to coordinate aircraft (the front one is for steering the ship). 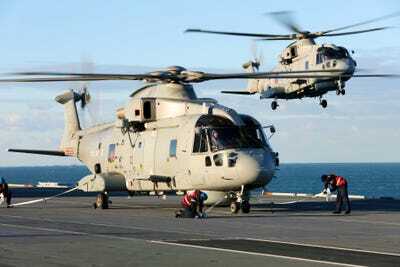 Above the door is written the Latin motto of the Aircraft Handling branch of the Royal Navy: Nostris In Manibus Tuti. And that was the end of our visit. The Navy took plenty of their own shots on the day too. 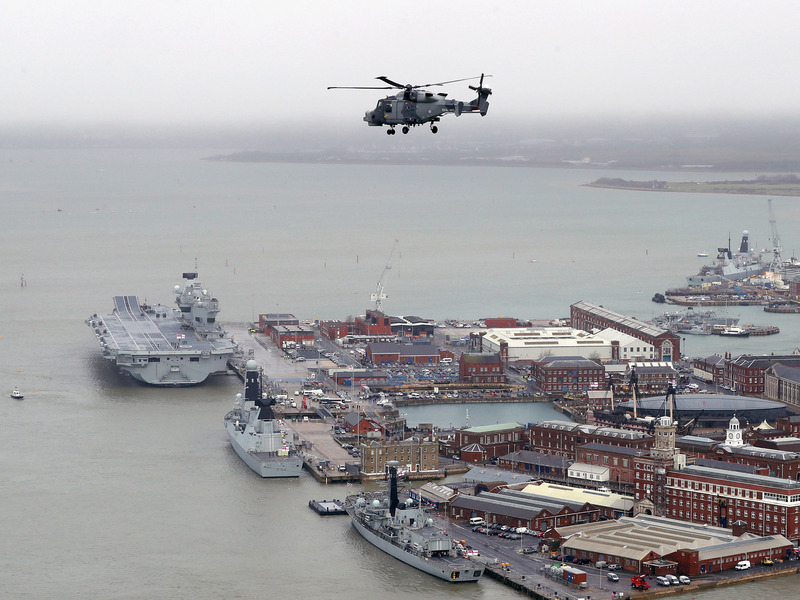 Here’s one from a naval helicopter during a ceremonial flypast, showing the Queen Elizabeth from behind. 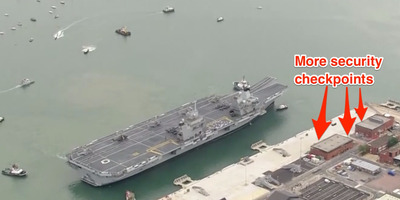 Crown CopyrightAn aerial image of HMS Queen Elizabeth and several other Royal Navy vessels during the commissioning ceremony. Since our visit in 2017 the Queen Elizabeth has gone from strength to strength. 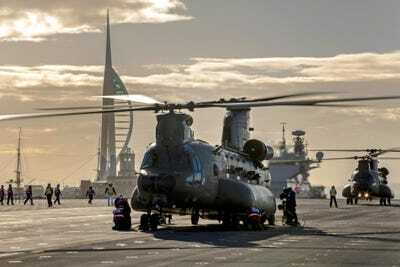 In February she set sail again, to learn to operate with helicopters. Business Insider wrote a separate article on that mission here. 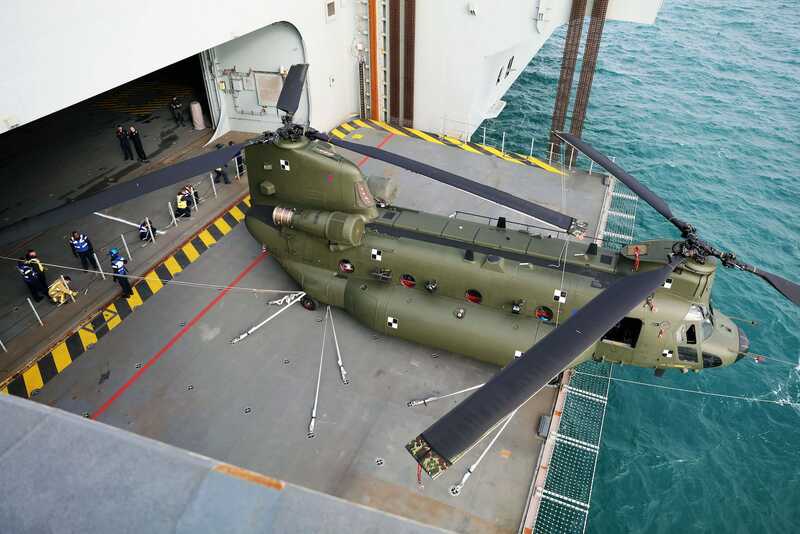 When rough seas hit during the voyage, the crew (just about) managed to manoeuvre the Chinooks into the hangar via the aircraft lift. 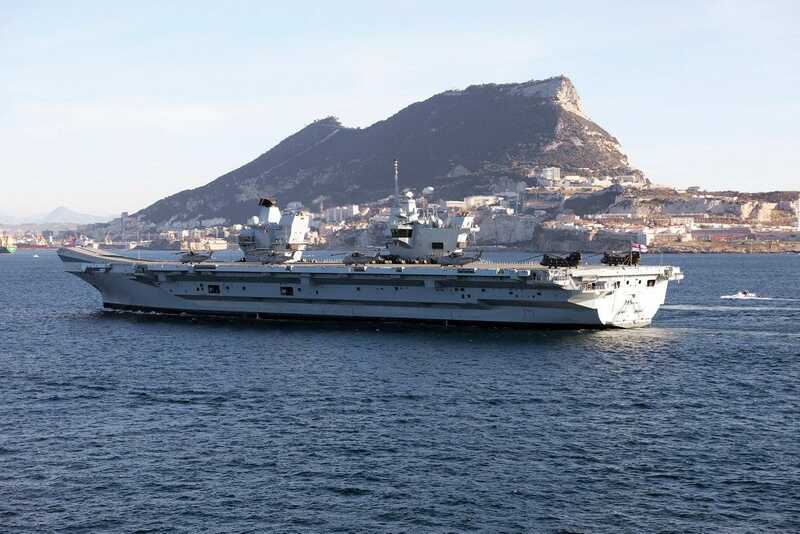 The mission took her off the coast of Gibraltar, a British territory in the Mediterranean which borders Spain. As of April 2018, HMS Queen Elizabeth was back at Portsmouth, being upgraded for the arrival of F-25B Lightning jets later a few months later. 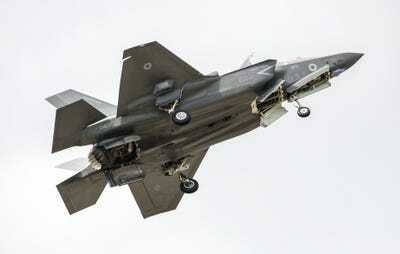 Here is one in action, with the trademark RAF logo on its nose and wings. And this computer-generated image shows what an F-35 could look like, with HMS Queen Elizabeth in the background, alongside HMS Prince of Wales, which is still under construction.